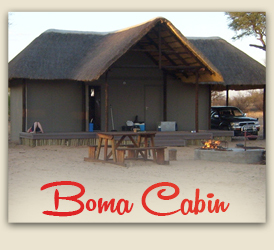 2 Luxury fully equipped self-catering Cabins sleeps 8, with 2 bathrooms and a spacious kitchen overlooking the watering hole, lapa and braai area. 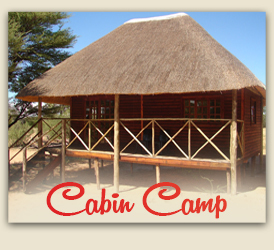 1 Self-catering Cabin in the Hunting Camp with 2 en-suite bedroomssleeps 2 each, a thatched deck and carport with a fully equipped outdoor kitchen and own braai (barbeque) area. 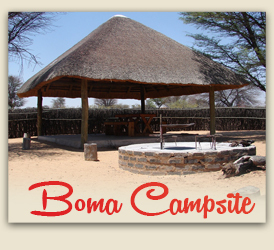 Self serviced camping area with lapa, braai area, communal bathroom, washing facilities and a panoramic view over the watering hole around the corner. 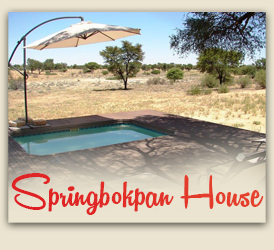 2 fully equiped three Bedroom houses with 2 bathrooms, lounge/dining room + kitchen, communal pool, lapa/braai area and a spectacular view on the game drinking hole.